From left to right: Dan Burack, Bernice Garnett, and Abby Burack. Dr. Bernice Garnett, associate professor of education, was honored as the inaugural Adam and Abigail Burack Green and Gold Professor of Education during a special investiture ceremony atttended by colleagues, students, alumni, friends and family on April 18. "We are pleased to be recognizing an outstanding faculty member, Bernice Garnett." said Shane Jacobson, president and CEO of the University of Vermont Foundation. "This professorship was established by Adam Burack, who received his degree in political science from UVM in 1985, and his daughter Abby, a 2016 graduate of the UVM College of Education and Social Services." When Adam’s daughter Abby enrolled in the early childhood education program in 2012, she represented the third generation of Buracks at UVM. After graduating in 2016, Abby followed her parents into the education profession, and she is now teaching preschool in Stamford, Connecticut. As an undergraduate she became particularly interested in a course on school climate taught by Dr. Bernice Garnett. The course focused on topics such as physical environment, interpersonal relationships, safety and health. The issues addressed in the course became the Burack's inspiration to endow the new faculty position that will continue to support this critically important work. "This is one of the highest honors the University of Vermont can bestow on faculty members, officially recognizing and ratifying academic achievements and further encouraging research and scholarship," said Jacobson. "Endowed positions have a powerful and magnetic impact," said UVM President Tom Sullivan, "creating a strong gravitational tug that helps retain and recruit top faculty and students while adding momentum to already strong departments and programs. Bernice Garnett is a shining example of this magnetism." 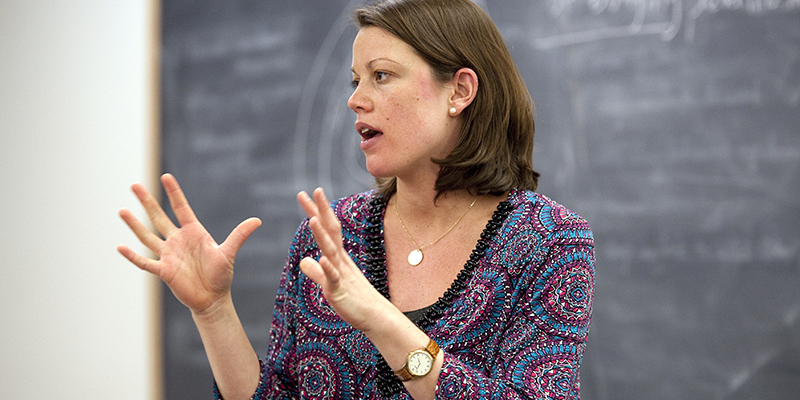 Garnett came to UVM in 2013 after receiving a doctor of science degree from Harvard’s School of Public Health. She also holds a bachelor’s degree in health and society from the University of Pennsylvania and a master of public health from Columbia University. She is a public health prevention scientist whose areas of expertise focus on school and community strategies to prevent bullying and the intersection with discrimination and harassment among youth. Her work addresses inequitable school discipline disparities by improving school climate through restorative justice principles, utilizing a variety of research methodologies, including mixed methods, community-based participatory research, and youth participatory action research. She also explores transdisciplinary school and community-based approaches to promote health and wellness, prevent childhood obesity, and increase food access and food security in underserved communities. A featured presenter at gatherings of professional educational research and public health organizations across the country, Garnett's work has been published in a multitude of peer reviewed publications. She is also the recipient of two research grants funded through the U.S. Department of Agriculture and the Vermont Department Health. In 2014 she was named as a Center for Rural Studies research fellow, and the following year she received a UVM Sustainability Faculty Fellowship. "Dr. Garnett is an extraordinary university citizen, having served on at least two dozen committees, research groups, panels, and work groups across campus over the past five years, including as chair of the Research Initiatives Committee in the College of Education and Social Services," said Sullivan. "She is a faculty member of the Food Systems Initiative at UVM, and chair of the Vermont Hazing, Harassment and Bullying Prevention Advisory Council." "It’s no coincidence that Adam and Abby have chosen to make such an important and significant commitment to their alma mater," said Jacobson. 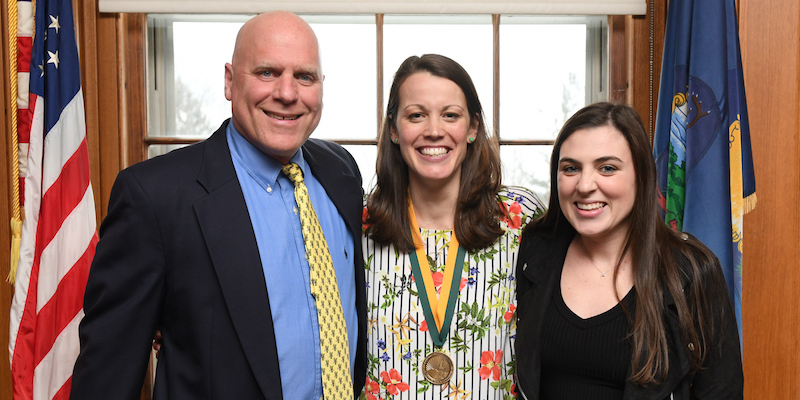 "They’ve had some extraordinary role models in Adam’s parents, Dan and Carole Burack, who have themselves upheld a long and dedicated history of leadership and philanthropy at UVM."